Since different types of straps require different strap button locations, get the strap first. Then simply have someone hold the instrument in front of you until you figure out where the best locations would be for how you want to play it. If you change straps, you might find that different locations are needed. I found this especially true with the Slider. Conventional strap positions, as introduced on the 1975 Appalachian by Oscar Schmidt, work better for a single strand strap. Using the Slider strap and those same strap button locations, the instrument wants to rest more like a guitar. That's actually what many people apparently prefer, but I don't think it serves very well. There are always people with exceptional requirements, but I believe the instrument can be played better when it stands as erect as possible and held quite high. The height issue is why the habit of playing while seated and with the autoharp resting on a thigh, preferably the left, causes us to get used to playing the autoharp "too low", and thus I think one needs a strap even while seated. The fanny pack thing is just a pillow on a belt, and that's okay too...whatever raises the instrument to better advantage. 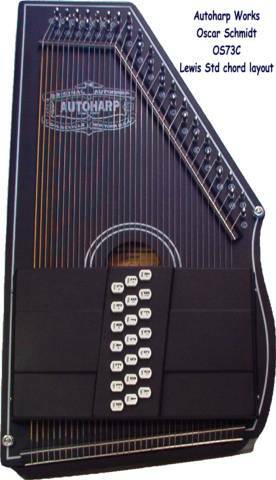 Remember that the autoharp was never designed to be played the way we typically play it. Intuitive methods are not necessarily optimal, when you really think it through. It's all kind of a pain, sometimes literally. You can't just pick up your autoharp and deedle away. You will get too used to it as an unfortunate habit. Instead there is a discipline of tuning it first if necessary, getting your picks, putting on your strap and getting hitched up, and then finding a proper chair suited for playing music. We no doubt all violate that discipline to some degree, but maintaining it is a worthy goal and has real benefits. I think fitting a strap and getting it right the first time is a two person job. A helper might have to get pretty familiar to do that, certainly in your space, so I suggest getting a mate or a person of the same gender to help. A Slider strap, for example, will tend to want to equalize the heights of the two connection points (buttons). You need to anticipate that in selecting strap button locations, or you will either somehow never be quite comfortable or will settle for the instrument taking more of a cross-body, guitar-like angle than you really wanted. How high the instrument is or at what angle it rides is a separate discussion. You can't fit a strap until you are settled on how you want the instrument situated. Following someone else's plan is a bit like trying to wear that person's size shoes. Don't settle for the playing position that the strap and strap buttons dictate. Change straps or move the buttons but be sure what result you want rather than drill a bunch of test holes. Of course, the goal is to drill holes only once. I can think of a list of DONT's based on experience or stories from others. 1) Don't install strap buttons without first drilling a hole. A screw can be forced though soft top wood, but when you hit the hard frame, the screw will snap unless drilled to where only the threads, not the shafts have to force through the wood. 2) Don't use a long screw intended for a guitar. Autoharps need screws that extend only 3/4" beneath the strap button. Use stainless or aluminum screws that won't rust. 3) Don't put a strap button on the bass side where the weight of the instrument would rest on it, when in a case. It will rub a hole in the case. On the face of the instrument or down around the end is usually better for that lower, right hand connection. 4) Don't put a strap button in a position like the back, where the strap in use would be pulling away from the button. That would require a strap locking device. 5) Don't place a strap button in the area where your chording side forearm would conflict with the strap or where the button would imprint on your arm. There may be others, but it is difficult to be positive and say exactly where someone else should connect a strap or exactly where the person can practically situate the instrument. People will do what they want to anyway. The picture linked above shows the strap buttons added to the same locations as first used on the 1975 Appalachian model. Note the silvery dots at the high string pin end and the low string anchor end. The treble or "short string" side button could be down on the side of the frame and still work very well. Tight fitting cases can be an issue, so check all the factors before drilling holes. The three point hook up would have a strap button on both sides of the anchor end. A third tether attachment could be an existing treble button, one of the tuning pins, or a strap button somewhere along the frame behind the tuning pins. I use a tether, just a leather shoelace with a looped end knot, and it gets attached to a tuning pin about middle G or so, never bearing much weight or pulling on the pin, so far not affecting tuning or flagpoling of the pin hole. I find that the conventional treble strap button location shown is too low to really control tipping when the instrument is held quite high. That varies some with instrument brand and accompanying shape, body depth, and size. I prefer the tether on a tuning pin, because that can be adjusted as needed when moving among various instruments with the same strap, and I don't have to drill a hole and install a pin. Note that using a tuning pin as a tether point is not good, unless the instrument is carried high, meaning the end of the instrument approaches the top of ones head, rather than hanging down around the chin or even ear height. You reach across to play, not down to play. Getting an ideal angle of approach for both left and right hand is not necessarily relaxed and comfortable. It all feels more "right" after practice and one gets used to it all. So, what works depends upon how the instrument is held. How the instrument should be held is debatable and will be controlled somewhat by variations in size and physique. However, there will always be some range within which an individual can make adjustments.